You don't have to sacrifice great taste to find cheap Virginia Beach restaurants. We're always looking for fun places to eat without breaking the bank (especially with hungry kids to feed!). Two of our favorite's are Moe's Southwest Grill, and Doumar's. Now, Moe's is a country-wide chain which fabulous Mexican food--excellent burritos, tacos, quesadillas, enchiladas, and salads-- and cheap, cheap prices. The servers always yell "Welcome to Mo-o-e-e-s-s!" when you walk in the door, and they have the best kid's meal deals on the market. 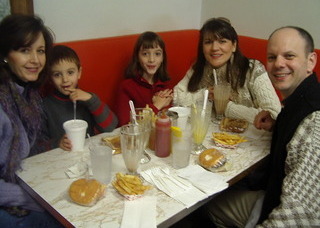 But if there's one cheap restaurant with a special place in our family's hearts, it is Doumar's. Doumar's? We go there--not just for the inexpensive and delicious comfort food--but also for the experience. It's nostalgia at its best. As you walk in the door, you think "Whoa...did I just enter a 50's time warp?" Nope. It's just Doumar's Drive-In. This grandaddy of cheap Virginia Beach restaurants is now an area landmark and a kitschy throw-back to a time long-gone, when car hops rollerskated up to your car to take your order. You'll see formica counters flanked by red, vinyl-topped swivel seats. Sure, it's not fancy, but that's not the point: it's the great food and cheap prices. How many restaurants can you find where you can eat at your car? It's a simple menu: burgers, malts (their chocolate malts are some of the best we've ever had), grilled cheese, pork barbeque, limeade, fries, and sandwiches. No plates or frills here: all sandwiches are delivered wrapped in plastic to keep their prices low. This cheap Virginia Beach restaurant is basic, delicious...and fun! Now for the funky history. 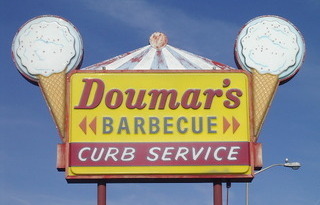 Did Doumar's invent the ice cream cone? We've read different versions (yes, he did, no he didn't) in various travel guides. 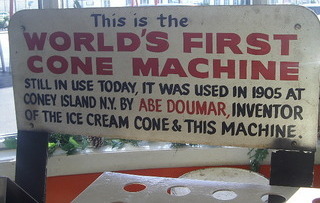 But after checking with the source (Doumar's), we learned that YES, Abe Doumar (Doumar's founder) did invent the ice cream cone! He also invented the ice cream cone machine. Seems Abe, a Syrian immigrant, worked the 1904 World's Fair in St. Louis. That's where the ice cream cone was first introduced to the world. But the cones were being sold faster than they could provide clean bowls. What to do? Lucky for us, a light bulb went on in Abe's noggin. He purchased a waffle from a nearby vendor, rolled it into a cone and topped it with ice cream. Voila! The ice cream cone was born. It was so successful, he designed a four-iron waffle machine and brought his parents and brothers to America. During the Jamestown Exposition of 1907, he launched his ice cream cone business at Ocean View Amusement Park. On a single day there, they sold nearly 23,000 cones! He designed an iron baking machine to mass produce cones. Then he went up and down the east coast selling his creation, before settling down to open this drive-in. You can see one of Abe's original original baking machines on display inside Doumar's. Here is the Doumar's website. Want to Eat Out for Half the Price or Less? 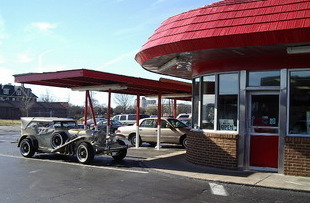 Having burgers and shakes at Doumar's Drive-In. Are you like me? Always on the lookout for cheap Virginia Beach restaurants and other ways to save when you eat out? Try Restaurant.com. You can buy dining certificates for less than half the cost of your meal. It certainly doesn't work for all restaurants, but your favorite might be on their list. And why pay full price? And for more restaurant deals, including places for buy-one-get-one-free deals, go to our Cheap Meal Deals page. And don't forget to check out sites like Restaurant.com, where you can buy certificates for deep discounts on meals.